There are cruises from Baltimore to the Bahamas throughout the year. Around 60 departures are offered annually. See the complete schedule below. 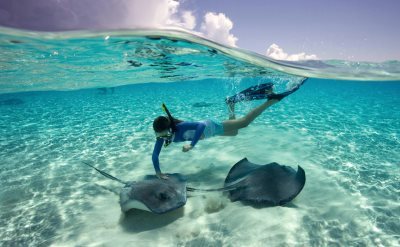 The Bahamas are a group of islands off the coast of Florida and they are famous for clear water, a big barrier reef, and a relaxed attitude. Average water temperatures run from 72 degrees in January to 81 degrees in August. You can swim with dolphins and snorkel with tropical fish. Go parasailing or rent a jet-ski. Royal Caribbean offers 9-night cruises from Baltimore to the Bahamas and Florida. They make a stop at Port Canaveral (Florida) so you can tour the NASA facilities at Cape Canaveral, or you can make the short trip inland to Orlando. The cruises also go to Nassau and CocoCay in the Bahamas. CocoCay is a private Bahama island just for cruise guests. Carnival Cruise Line has a variety of 7-day Bahama cruises from Baltimore. They include a stop at Princess Cays, Port Canaveral or Grand Turk. Each year nearly 50 Bahama cruises from Baltimore are available that are one-week long. Most are on Carnival Cruise Line. 7-night Bahamas cruise on Carnival Cruises. Round-trip from Baltimore to Princess Cays (Bahamas), Nassau (Bahamas) and Freeport (Bahamas). • 2019 departures: November 17, 24; December 1, 8, 15, 22, 29. • 2020 departures: January 19, January 26, February 2, February 9, February 16, March 1, March 8, November 15, November 22, November 29, December 6, December 13, December 20, December 27. 7-night cruise to Bahamas & Caribbean on Carnival Cruises. Round-trip from Baltimore to Grand Turk (Turks & Caicos), Half Moon Cay (Bahamas) and Freeport (Bahamas). • 2019 departures: April 14, 21, 28; May 5, 12, 19, 26; June 2, 9, 16, 23; July 7, 14, 21, 28; August 4, 11, 18, 25; September 1, 8, 22, 29; October 6, 13, 20. • 2020 departures: March 22, March 29, April 19, April 26, May 3, May 10, May 24, May 31, June 7, June 14, June 21, July 5, July 12, July 19, July 26, August 2, August 16, August 23, August 30, September 6, September 13, September 20, September 27, October 4, October 18. 7-night cruise to Bahamas & Caribbean on Carnival Cruises. Round-trip from Baltimore to Grand Turk (Turks & Caicos), Princess Cays (Bahamas) and Freeport (Bahamas). • 2020 departures: March 15, April 5, April 12, October 11, October 25. 7-night Bahamas & Florida cruise on Royal Caribbean. Round-trip from Baltimore to Port Canaveral (Florida), CocoCay (Bahamas) and Nassau (Bahamas). • 2019 departures: November 16, November 23, December 28. 7-night Bahamas & Florida cruise on Royal Caribbean. Round-trip from Baltimore to Port Canaveral (Florida), Perfect Day at CocoCay (Bahamas) and Nassau (Bahamas). 9-day Bahama cruises are available out of Baltimore each year. They include stops along the southeast coast as well as two Bahamas islands. 9-night Bahamas & Southeast Coast cruise on Royal Caribbean. Round-trip from Baltimore to Port Canaveral (Florida), Miami (Florida), Key West (Florida), Nassau (Bahamas) and CocoCay (Bahamas). • 2019 departures: June 27, August 22, October 17.